New Zealand fast bowler and Man of the Match in the first test against Pakistan, Shane Bond is ruled out of the ongoing Test series due to a torn abdominal muscle. 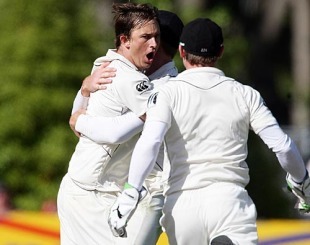 Shane Bond took 8 wickets against Pakistan in the first test at Dunedin. Bond suffered minor abdominal discomfort following the first test & scans on Tuesday revealed a one-centimetre tear in an abdominal muscle. Kiwi team manager David Curry said that Bond will be 'rested' for the second and third test as a precaution. It is been said that he is expected to recover in time for New Zealand home series against Bangladesh early next year. Meanwhile, Kiwi selectors would be naming the replacement for Bond by Wednesday for the remaining Test Matches.